The most dangerous thing in your kitchen right now is probably that blunt knife at the back of the drawer with all the junk in it. The problem is that many people find sharpening a knife tricky. There’s a definite knack to sharpening a knife properly, and not everybody has it. Most of us need a bit of help. 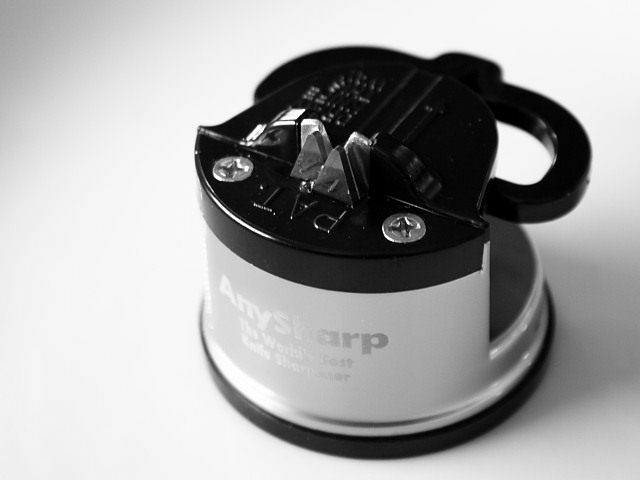 “The AnySharp Pro Knife Sharpener”? Sounds a little Shopping Channel, doesn’t it, especially with the strap line of “The World’s Best Knife Sharpener” attached to it, but don’t let the terrible name influence you too much. This is a first-rate knife sharpener that will rejuvenate the dullest of blades, safely and with next to no effort. The knife sharpener has a suction base that clamps to a kitchen work surface like a limpet. Once it’s fixed in place, it isn’t going anywhere. After fixing the thing to something flat and solid, sharpening a knife is as easy as sliding the blade between the jaws. A couple of strokes is enough. You’ll be left with an alarmingly sharp knife, but also an equally alarming pile of metal filing as well. This is where the trade-off lies. Depending on the knife, that pile of filings might be OK.
Everybody has a couple of cheap paring knives or a slightly rubbish set of blades from Ikea, and for this sort of thing, the AnySharp Pro is absolutely ideal. It’ll keep this sort of blade razor sharp with minimum effort. I wouldn’t recommend using the AnySharp Pro on a very good knife, or at least not regularly. You could easily ruin eighty quid’s worth of Wusthof with this little gadget if you’re not careful, but if you use the AnySharp Pro very occasionally, and keep your expensive blade honed with a steel as well, it could prove very useful indeed. It can rescue a dead blade with ease, and that’s why it’s a good buy. has a place, just be careful how you use it – gently, not too often, and on the right blades. I've got one of these. It seems our knives (a set of five from The Range about three years ago) blunt really quickly. So there I am, struggling to chop and onion. A few little slides through this baby and I'm all set for chopping. We are looking into getting some really nice, expensive knives, now that we are cooking more and more, so the advice not to use them too often on something like this is useful. Thanks. I have one of those sets of Ikea knives you mentioned. I've been using them for 15 years. However, I have always wondered why I'm rubbish at chopping things. And then I got some new expensive knives for Christmas. Now I know why! I’m always saying I’m going to buy a knife sharpener but I always end up trying to chop something with my blunt knives. This time I’m really going to buy one. And this one seems to be really good, so thank you for sharing.